Great tent and even better customer service. I've had this tent for 2 years and counting. I go camping with my son's scout troop at least once a month and we do a family trip about every two months so my tent gets used about 18 times each year. We typically camp in the California desert but also go to the mountains and the beach. When shopping for a tent, there were 3 things I was looking for. I needed to be able to easily set it up alone, it needs to be able to hold up to strong winds with out caving in and I wanted to be able to stand upside of it. 95% of the time, I set up Friday night in the dark after driving 2-4 hours. The aluminum poles fit together nicely and they do not get hung up on the pole sleeves on the top of the tent. I've had that problem when using fiberglass poles on other dome tents. When completely staked out, this tent has held up to sustained 30-40 MPH winds and the fly barely flutters. A 50 MPH gust one time started bending poles and we just did a trip in March where we experienced 70 MPH gusts and that was enough to break several pole and bend the majority of the others all to hell. I haven't been out in the rain much with this tent, everyone knows that it doesn't rain in California so what can you expect. The few times I got caught in the rain, nothing leaked but the welcome mat was a puddle catcher. The simple fix for that is tucking it under the tent if expecting rain. Ventilation and storage is great. The mesh sides keep condensation from forming and I use all of the pockets on the inside for stuff when I'm base camping or at summer camp. There are little loops to hang things on in the corners also. The zippers are holding up well and I wax the door zipper about every 9 months or when ever it starts getting hard to close. I've noticed that the poles take on a slight bend after being set up for week but it isn't enough to warrant replacing them and that don't appear to be getting worse. Also the stakes that came with the tent are useless in anything soft but work well in hard pack dirt as long as there is little to no wind. I prefer to use 6" or 8" MSR stakes and keep the BA stakes for back up. So far this tent is holding up well overall but after that March trip, all three poles were trashed, the fly was torn where one of the broken polls whet though, there were a few other punctures in the tent and one of the tabs where the fly awning pole attaches to was starting to rip off. I contacted BA and described the damage and they said no problem, send everything in and we can fix it. 2 weeks later, I get an actual phone call from the person assigned to handle my repair saying everything was fixed and good as new. I was expecting him to say, sorry this thing was too trashed to fix. The total for the new poles and repairs came out to only $45 bucks! I couldn't believe it. The bottom line is that this tent meets all of my needs and when I break it, it isn't going to cost an arm and a leg to repair. I will be a BA customer for life. With exceptional service and highest quality materials Big Agnes has done a magnificant job for this family car camping tent, but it is time to redesign it for 2013. With close-outs you just can't beat the price you will pay for a Big House. Tie-downs for the rain fly to the poles give strength to dome tent. Ripstop fabrics are used through-out. You can make a deal on these close-outs. The Big Agnes Big House 4 was made for the starting family and those looking for a great shelter for under $350, including footprint. The BH-4 is for those who enjoy car camping, but lightweight enough to be split between two or three people for backpacking. Because it is presently on close-out sales it is an excellent bargain and can be gotten for a lot less. It is too early to speak of the Big House series for 2013, but they will have no back door on the new design, only a front entry. Obviously this will change the design of the tents quite a bit, but there will be more red color. 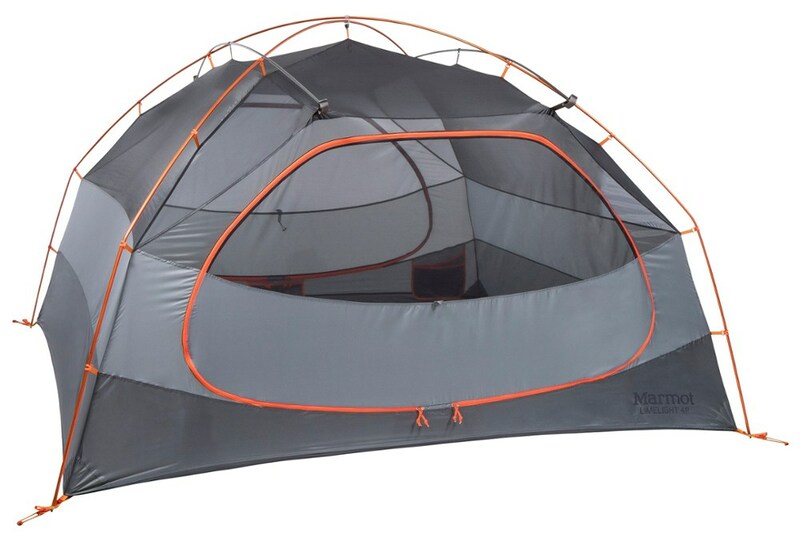 This four-person Big House legitimately has adequate space for 3 people, and that goes for most 4-person rated tents. It has features you expect to find in more expensive models, including color-coded coded webbing and buckles, locking pole ends and grommets, pole clips, sleeves, sealed seams and a bathtub floor to prevent leaks. 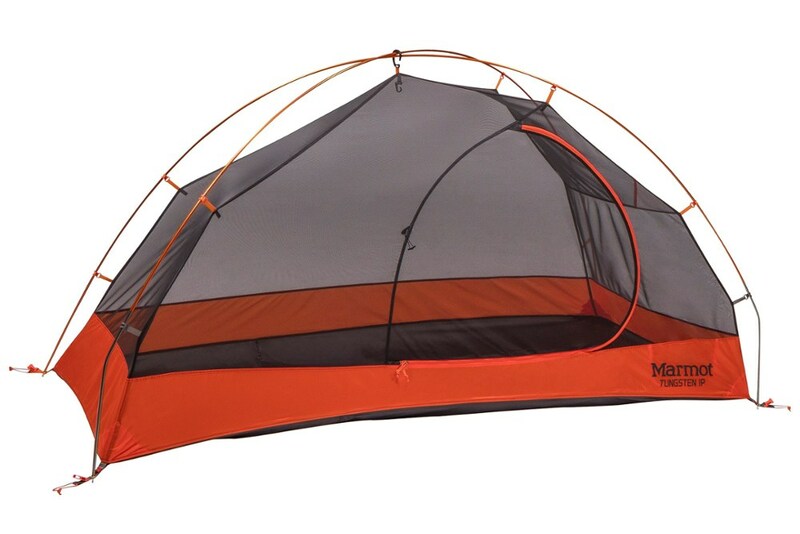 The BH-4’s excellent pole structure provides sufficient head room up to 5 feet 8 inches, and creates lots of livable shelter for comfortable family car camping. The poles are lightweight DAC PressFit, TH72M 7001 aluminum (the latest technology in lightweight tent poles featuring improved durability) and of varying diameters to save weight. The sturdy three pole design does a great job in preventing collapse in strong wind gusts, as long as it's staked properly with provided reflective guy-lines. This freestanding dome tent has two large D-doorways and the mesh access panels can be sealed. One drawback is the lack of a fly vestibule, but the 65 sq. ft. permits room for gear inside the tent. From a pitching perspective this tent is a breeze. For first-timers setup might take 30 minutes to piece everything together. But later it could be done in as little as ten minutes for only one person. However, the BH-4’s rain-fly has back-side ties that need to be attached to poles, which might add a couple of minutes. Significantly you will find the tie-downs on inside of the fly — something you won’t discover on cheaper tents. These side release buckles attach the fly to poles for fast easy set up and keep them from separating during storms. 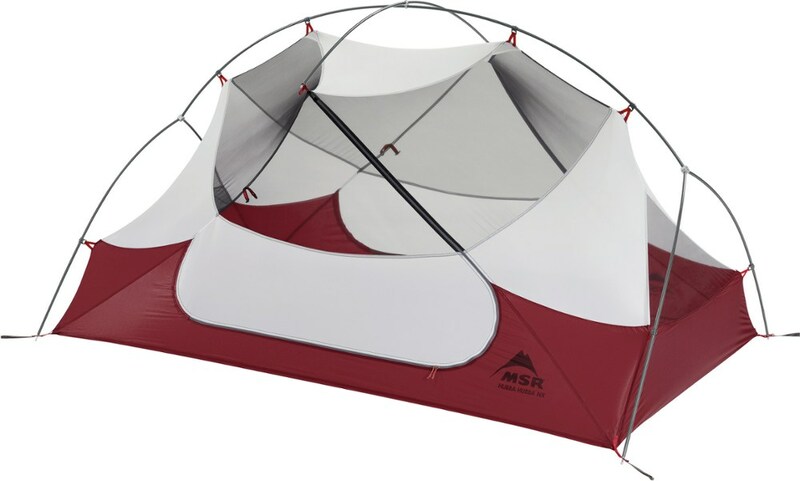 They provide overall strength and wind resistance that plagues cheaper high profile dome tents without them. The fabrics of the body, doors and fly are all 75 denier ripstop - usually found in more expensive offerings. All seams are waterproofed with solvent-free polyurethane. The polyester mesh ceiling, wall panels and ground level side vents promote air circulation. Inside this tent are several mesh storage pockets that comfortably store most lightweight gear and electronics, keeping them off the floor or just organized. As a suggestion, it is good practice to invest in more rugged tent stakes. Ones that can be driven. And I personally would get rid of the little plastic tensioners that come with the guy-lines, using others such as: MSR Cam Rings, Nite Ize Figure 9s, or Taut-ties. Other purchases might cover optional equipment including a footprint, gear loft and an extra large zip-on front vestibule — 52 sq ft — which hooped for more room. These are sold separately. 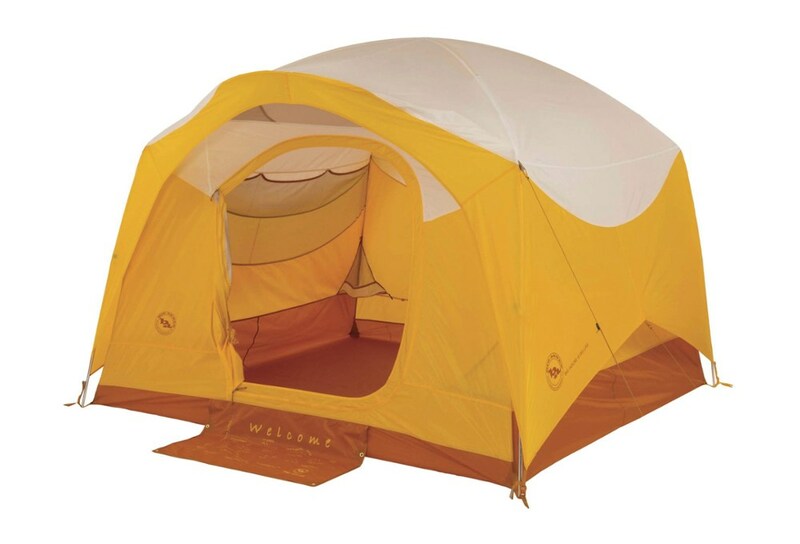 And if there is need for a larger sized tent you can always move to the Big Agnes Big House 6. Also note, the outstanding customer service of Big Agnes is unexcelled. You won’t have lots of aggravation if you have a problem; it is something that will be taken care of. With Big Agnes you know they stand behind their products with a real lifetime warranty, and not excuses. Now, all we have to do is to await the Big Agnes’ 2013 models of the Big House 4 to find out where they have made them better, if not for at a greater price than the current 2012 close-outs. I purchased the Big Agnes Big House 4 because I wanted a tent that was tall enough for me to somewhat stand up in (I'm 6 ft tall), but with a small enough footprint to prevent me being a space hog in a small camp with a number of other campers. In this respect, the Big Agnes was ideal. Over a ten-day period on the SD prairie, we experienced wind gusts of about 30 mph and intermittent thunder squalls. The rain fly held well and the tent was stable, despite its height. I always stake and tie down everything available when we camp out there. It probably should go without saying that four normal sized adults would likely find this a tight squeeze, but 1-2 adults would be comfortable. I was quite comfortable with the space. However, I have two significant problems with this tent. The first is with the large triangle shaped vent in the back of the tent. We were camped on a prow next to a shallow ravine. When the wind first started to blow, it blew the rain up under the rainfly awning in the back, and made a fine, but significant spray on me, my sleeping bag, etc. This naturally increased as the wind picked up. I sealed the "blow hole" with duct tape and a plastic bag. With all the other screenhouse ventilation in the tent, this vent should be smaller, and positioned on the higher end of the back tent wall. I do a lot of uneven ground camping, often in mountainous areas. So this is a huge issue for me. The second problem is the fact that despite the fact that my setup was careful (and no kids or pets), and the tent was covered with the rainfly for the duration of my ten day stay, the screens are significantly snagged. The screen on the front door/window is particularly bad, but even the other screens that were continuously under the protection of the rainfly are snagged...soon to be holes. From my perspective, this is unacceptable after one use. I haven't decided if I am going to return the tent, but I certainly wouldn't purchase another one. It just doesn't hold up. Another camper who had a tent that cost a fraction of the Big Agnes left camp with no leaks and her screening intact. My other larger old Columbus dome tent that was significantly less investment than this one, has been in use in all kinds of conditions for years and is still in excellent condition(can't find it anymore or I would buy another!). I expected better from Big Agnes. 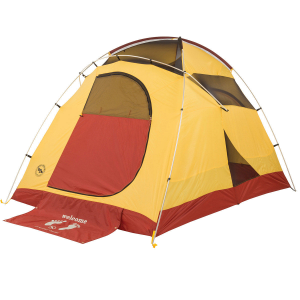 I love this tent, which is easy to set up, roomy, full of features, and very durable! I love this tent! It's my favorite out of my four tents and I often use it even if I'm camping by myself rather than using one of my smaller tents. 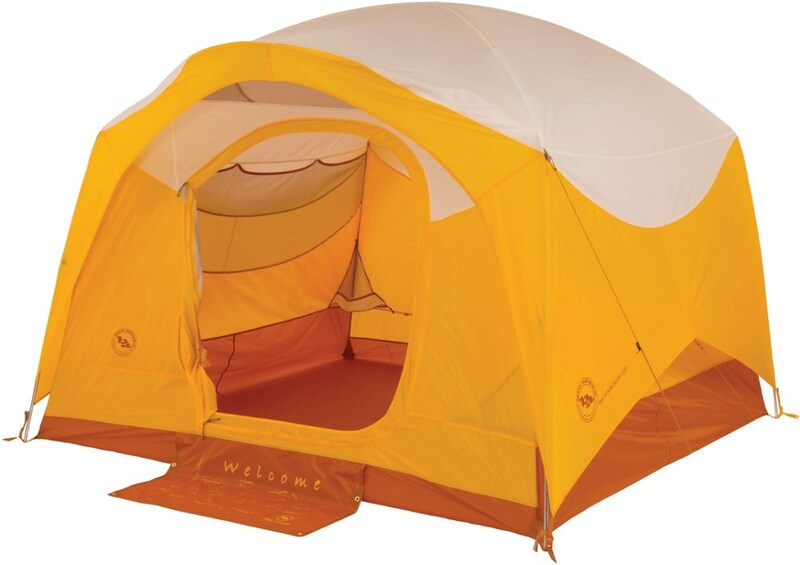 It's very easy to set up, roomy, and durable, and the huge optional vestibule is a must-have, as it provides tons of space for gear and is also perfect for sitting under for shade or shelter. Best small family car camping tent there is! It's been perfect for my wife and I and our dog on camping trips, definitely the best tent I've ever had! Super easy to set up, no snags at all! Haven't used it in high wind but it should be pretty stable even though it's pretty tall. The fly is really nice but doesn't cover all of the doors. All the times we've slept in it there hasn't been a single bit of condensation. A really cool feature is that the sides of the fly roll up easy and then it's all open, handy during the day. Then you just roll it back down and clip it and it's all set for privacy or shelter at night! Another super nice thing is that it's very tall! My wife doesn't have to bend over at all, and I have to just barely duck, and I'm 6'2". So this is super nice for changing clothes especially. It comes in a duffel bag and it the easiest tent to pack away ever, you don't have to roll it up and squeeze it into anything, fold it up and shove it in the bag and it's good to go! I know this tent will last me probably all my life and I'll get tons of use out of it! I have only gone camping with the tent one time but really enjoyed it. The design is great. Yes, it is good to take advantage of the guy lines on the fly to get proper stability. Concept/design wise this tent is a winner. The roll up fly for view/ventilation, even with all guy lines employed is great. I noticed the screen material was different than other tents (different in a good way as it beefy). The ventilation can become too much of a good thing, as the awning on the back door can be like a scoop to the adjacent roof vent, But don't let that stop you from buying this outstanding tent. We carried the Big House 4 three and a half miles split between two packs. Set up was easy with two people and the tent felt sturdy staked out. We found it very spacious and the side pockets endless. My height is 5'8" and I had room to spare standing. The fly conveniently rolls up exposing huge screens. Zippers were smooth and the fly was tight through a good breeze. It will comfortably sleep four while guarding against the elements. We will use this tent on all of our multi-person trips for years to come. We like it a lot. I quickly returned this tent after a weekend of using it. First the “features”: the welcome mat seemed a nice feature at first; but then it rained, and the waterproof mat turned into a puddle – right in front of the door. The skylight also seemed a nice feature. We could watch the rain, but once the weather dried out, it let the midday sun shine right on my face while I tried to take a nap - very annoying. The screening was nice and the storage pouches which ran the entire side of the tent were handy. The back “door” opens downward, so it is really more of a window. One nice feature was the tie loops along the sides of the fly to permit rolling it up and allow the side windows to get better airflow. The setup was straightforward, but the pole that spanned the middle of the tent tended to float off the ground, causing the floor to not sit right. As a result this tent really needs to be staked out to perform. Overall, I was disappointed with this tent, and returned it to REI. For a comparable price, I found the Kelty Green River to be a better tent.